An area of mixed woodland and grassy open spaces for community use, converted from farmland into a village green, but also including a hay meadow. 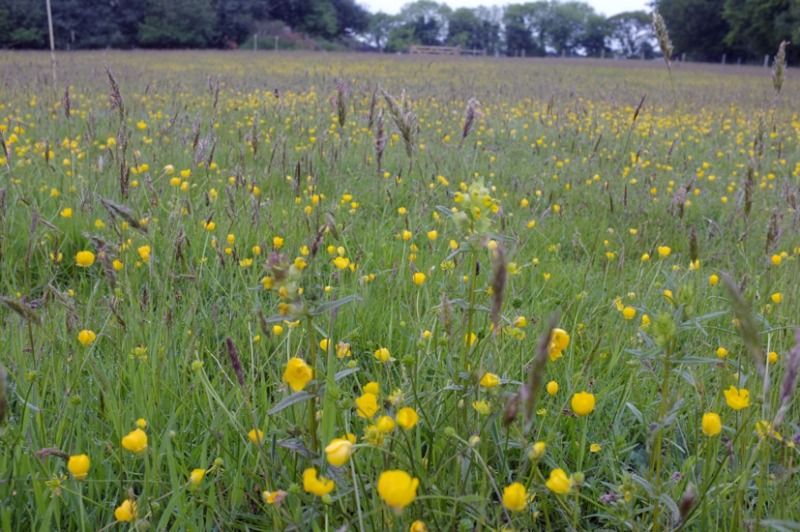 The Bridford Trust’s hay meadow is located in Bridford Woodland Park, an area of mixed woodland and grassy open spaces created and developed for community use. The Woodland Park originated as a modest millennium project to create a small village green. 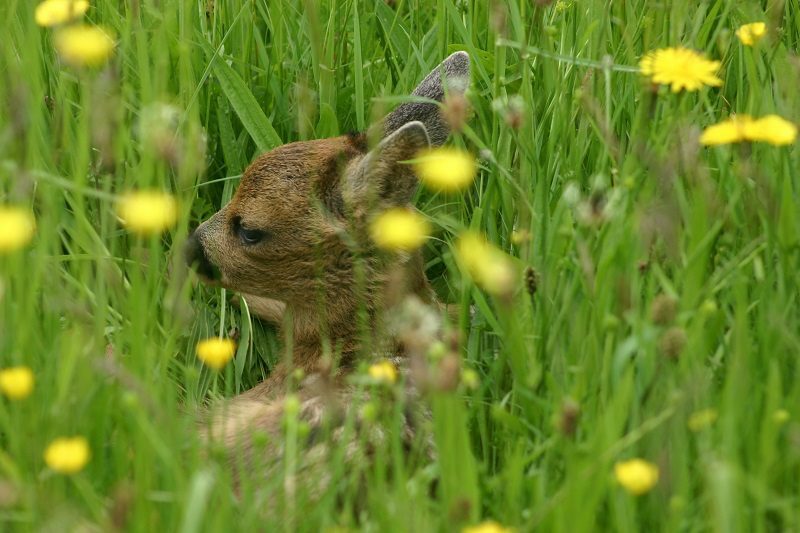 Though it missed the 2000 deadline, by 2002 the project had expanded into a much larger undertaking to convert four acres of farmland into a parkland area incorporating a village green, but also including a variety of different habitats, amongst which was a hay meadow. 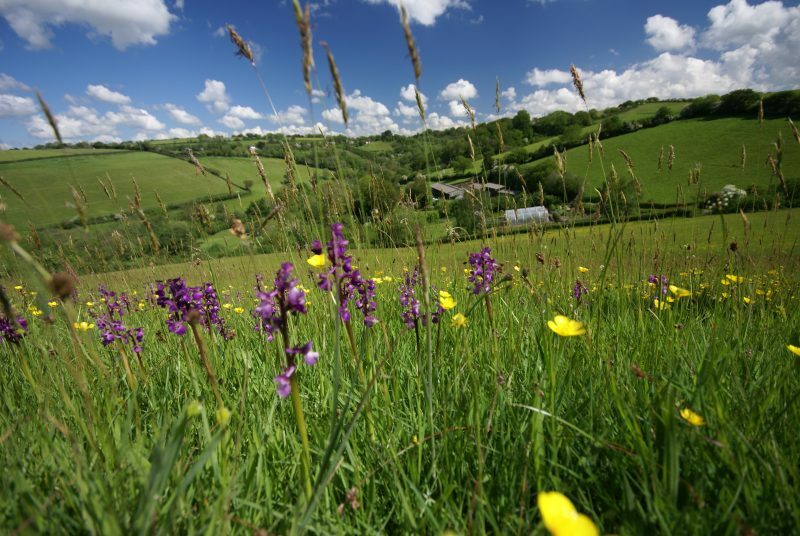 The meadow occupies a third of an acre surrounded by developing woodland, and was created by stripping the nitrogen-rich top soil, which we were able to sell and helped fund the project. Species rich hay, from Runnage Farm, Postbridge, was laid on the resulting bare ground. The hay was left on the surface, and in very little time with wind and rain it had settled on the ground, forming a thinner layer with bare ground between. Over the spring it gradually “disappeared” into the soil. The work was all carried out by volunteers from the village and we waited in eager anticipation to see what the first season would bring. Everyone was absolutely thrilled when come early summer the whole area was a sea of bright red poppies! However, we recognised that this was just a one-off flush of arable “weeds” and if the soil was not disturbed again the more typical meadow plants we wanted to encourage would be quietly establishing themselves. Over the next two years we watched with interest as a carpet of fine grasses developed, with welcome species like Yellow Rattle, Eyebright, vetches and Ox-eye Daisies making an early summer showing, followed in July by a good spread of purple Knapweeds – great for attracting butterflies. 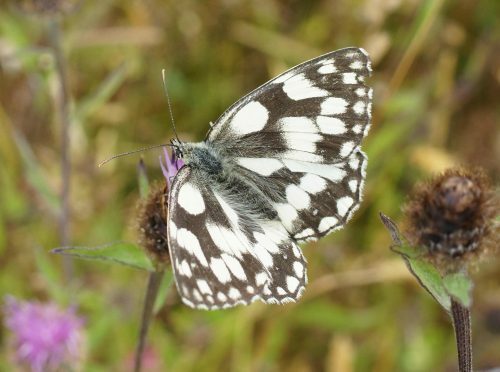 Marbled White butterflies, in fact, soon colonised the area; the flowers and the fine grasses no doubt encouraging this. We were also pleased to discover a few Devil’s Bit Scabious plants had established themselves. In order to allow this late flowering species to set seed we have usually cut the meadow late, typically in September. 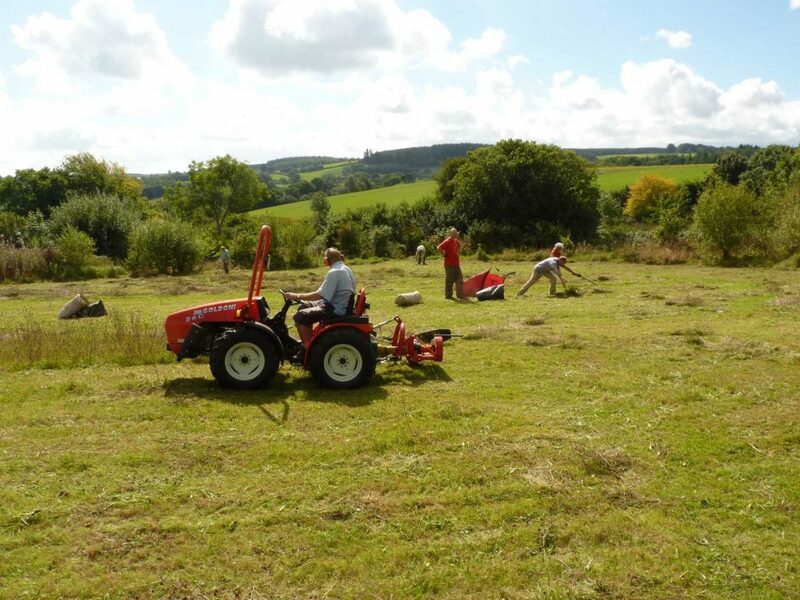 All the work of cutting the hay and removing it is done by volunteers from the village. We have been rewarded by a gradual increase from an initial half dozen to almost 100 individual plants in 2017. Our most exciting botanical happening, however, was the appearance in 2013 of 30 Southern Marsh Orchids. All in all the meadow has wildly exceeded our expectations and now not only provides an interesting botanical feature within the park, but with a comfortable bench located nearby, it offers an attractive and tranquil spot where visitors can linger, relax and enjoy this special place. Bas and Rosemary Payne let the grass grow up in a wild area of their garden and were bountifully rewarded - with many wildflowers, butterflies, slow worms and more. 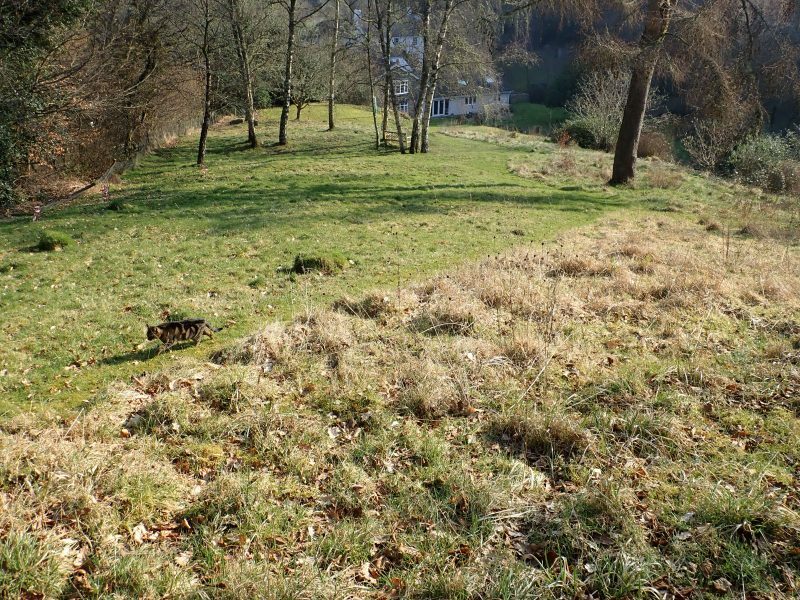 Three acres restored from a sheep-grazed pasture into a haven for wildlife.